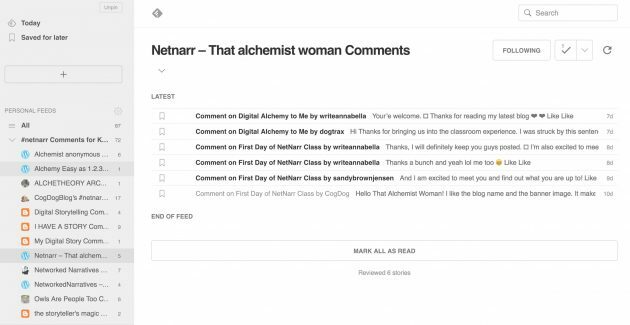 This post is meant primarily for participants in the Networked Narratives course I am co-teaching with Mia Zamora, where everyone is publishing in their own blog space. Everything here applies as well for the Open Learning ’17 course led by Gardner Campbell; I’m working on both sites at the same time, so things I do on one cross over. In terms of staying tuned into news and current interesting information, many people these days rely on social media. For me, that is part of my information flow input, but not only one. Yes, I find many useful things shared by other, but it depends on when I tune in, who I follow, and how deep– it’s pretty much accidental serendipity. My more primary means is checking regularly maybe 150 different websites, mostly blogs. Do I visit 150 blogs on a regular basis? Heck no. I make use of the same three letter technology that we had you trip over to connect you blogs, RSS. These feeds can pull the stories from hundreds of sites into one interface where I can scan them like subject lines in my email inbox. Just like there, I can skip stuff that is not important or interesting (that’s why blog post titles matter!). In an open networked course, I want to be more confident I am scanning the activity, especially for my students. And even more so as a teacher. One thing I can do is go to the course home page, and see the new posts displayed at the bottom. That’s the full flow of all blogs. In a busy course, it starts as a trickle, then becomes like a garden hose, and eventually a high pressure firehose. 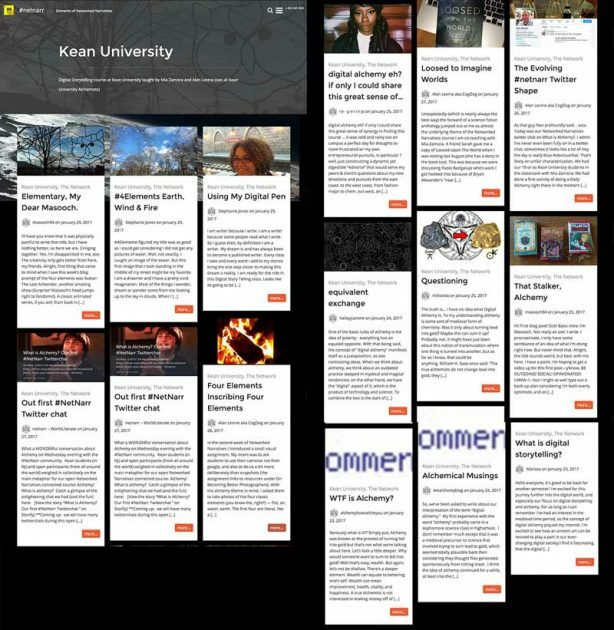 With the way I set up syndicated sites, we can slice the flow; in networked Narratives we have a page for posts just by Open Participants or just ones by the Kean University students. So I am going to share you some web alchemy, and a magic potion called OPML. 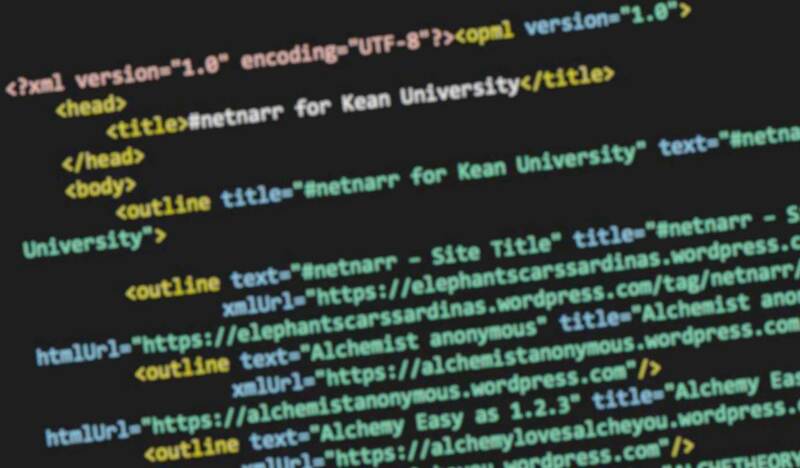 You need not know what that stands for (make something up), nor do you even have to look at it (it’s cryptic XML, don’t look). If you can understand that an RSS feed represents an updated data file that shows the latest content of one blog, and OPML file is a bundle of links to RSS feeds, it’s like a mega subscription file. It’s like a big folder of — okay, the metaphors are getting in the way. First we need to get these magical mysterious files. 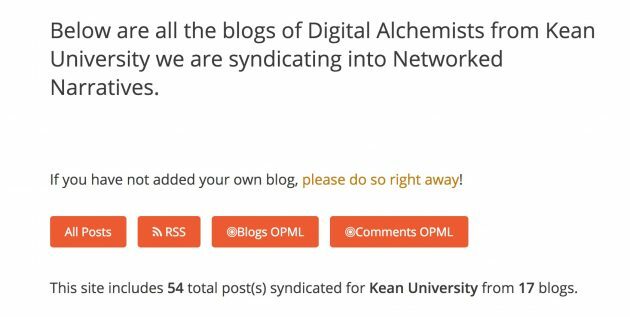 I am going to do this with the interest of following just our Kean blogs, but this could work for all of them or the open ones as well. You will find the same links on all. 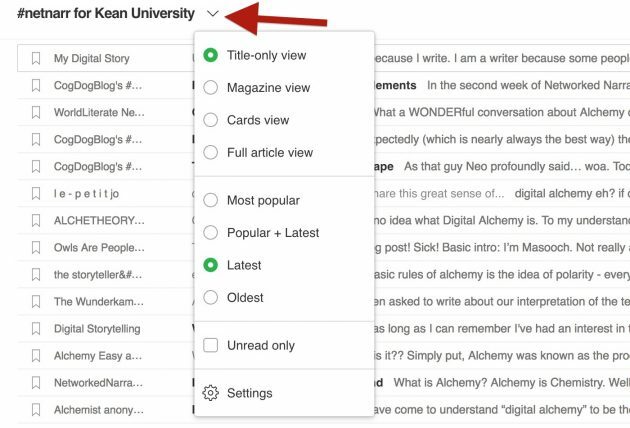 From each of these “flow” pages, in the header you will find links to a page that lists all of the blogs that are connected, I call them Notebooks — here is the one for Ken alchemists (see also the one for all blogs or open ones). Click the buttons for Blogs OPML and the one for Blog Comments OPML (you should do this on a computer, mobile devices probably will cry when you click on these). Both links will save files to your computer. Just download them. Do not open them. 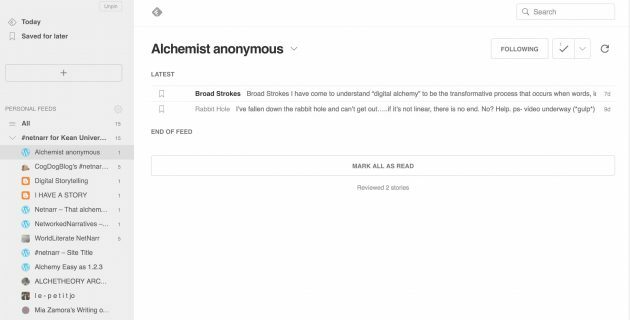 To set up yourself to be an OPML Alchemist, you need a tool called an “RSS Reader.” There are a number you can use (Google had a great one, and they killed it, sigh. I’m still in mourning). I will recommend Feedly, but you could easily use other ones. Feedly is free, go create an account. It will give you something blank. Like twitter, they want to suggest things for you. Do that later. Or never. So first import the Blogs OPML file you downloaded. Lights may blink and gears are churning. On the left side, you will see a link that represents all of the blogs listed in the file. On the right will be some kind of listing of the posts from these blogs, the newest ones first. Posts from all the blogs in one OPML file. Cool! The titles in bold are ones I have not read. So the interface can tell you at a glance what is new. When a post os open, if you click it’s title, you can then jump over to the blog itself if you prefer reading it there (or if you want to add comments). You can even use keyboard shortcuts to read through them– j loads the next one and k the previous. You can read through many blogs this way. Okay, let’s breathe. With this set up, we can read a whole bunch of blogs in one single interface. When a blog publishes new stuff, it will be updated here (there might be some lag in how often feedly checks for updates). That’s why I consider this one of the few technologies I can safely say that it saves you time. Okay, but there is the second OPML file. We use the first to read the posts. The second one contains the activity on the comments to all blog posts (this works for blogs published on WordPress or Blogger only). 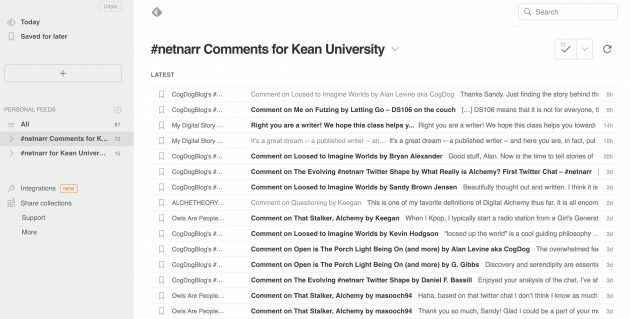 That’s right, folks– you can monitor the comment conversations on hundreds (or 10 or 3) blogs in one place. AMAZING! ? Now import the other OPML file, the blog comments one. Just flip through them (j and k are your friends), and if you want to respond, click the title and jump out to a blog. Yes, Writeannabella is getting good activity on her new blog– I can see it in a glance, as well as seeing that there are no comments. At once glance, we can get a sense of the participation level on every blog or the community as a whole. 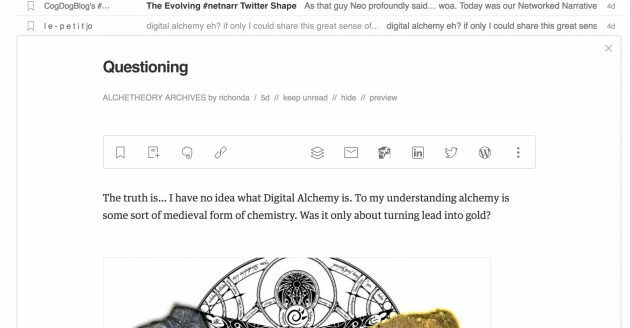 I cannot say enough how critical this alchemy is to stay in touch with the activity in an open networked course. Yes, it is good for teachers, but it is just as useful for participants to take in all the activity in one place. Are you ready to do some OPML Alchemy? Fear not the funky acronyms! Jeez, news I can use! Thanks Mr. Wizard! I’m looking at doing something similar with courses delivered in WP with independent student blogs. I’m using FeedWordPress to aggregate, how are you generating the OPML file? 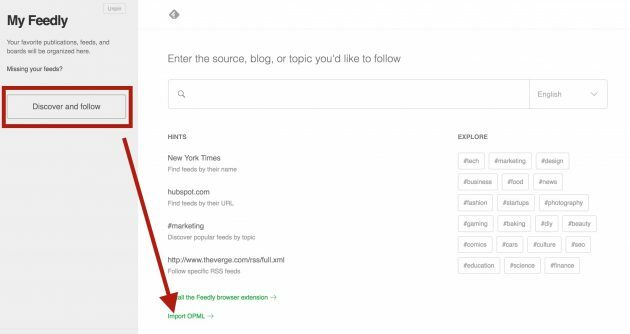 Is there a plugin that will generate one from the syndicated feeds? I’m hoping to blog this soon, maybe tonight. I have had dreams for a while of rolling all my custom code I do on FWP sites into a plugin, including a blog registration form. Always short on time. These OPML are code tucked inside a page template that is never seen, so it would work if you are able to add files to a theme. It might need a few lines in a functions.php too, but all doable.